If I remember rightly, she had bought it second hand off Trade Me, and over it's lifetime, it had been very much used. 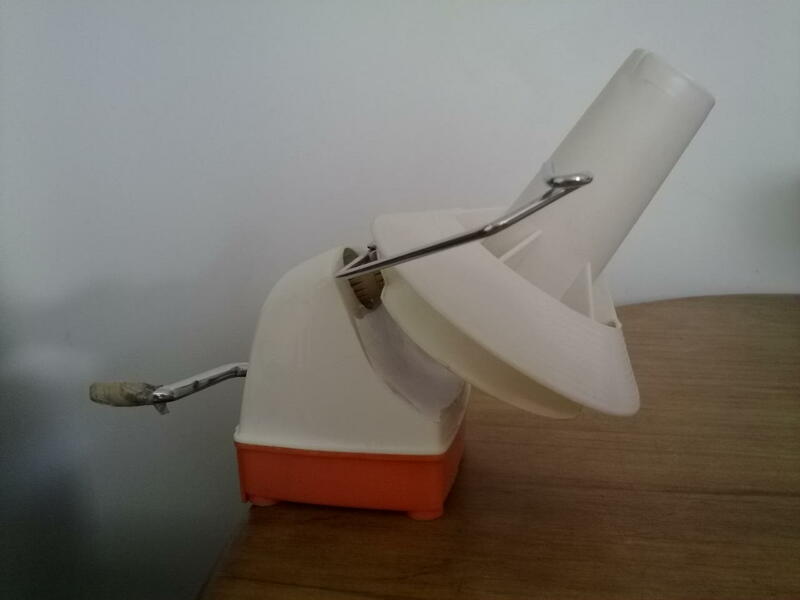 So much so, that the wee handle had broken off at some point, and been replaced with medical tape to avoid the user developing nasty blisters. She had upgraded to a snazzy electric winder, so passed on the ageing ball winder to me. I have used it a lot in the last year or so (and I mean a lot! ), and now its on its very last legs. It winds inconsistently, and makes horrifically loud crunching, grating noises whenever its in use. I dearly loved it, but had been thinking for some time about replacing it before it fell apart completely. Unfortunately, to buy a brand new ball winder here in New Zealand, it would cost around $65-$70. They're much cheaper in the US, but once you add on conversion rates and shipping charges, it just didn't seem worthwhile. I was planning on waiting until I could organise delivery and shipping of a batch of Knit Picks yarn with a friend in the US, and would add in a ball winder at the same time (because of course they don't ship outside the US, so you need a friendly, generous person willing to take delivery of your order, then send it on to you). So I persevered, trying desperately to wind yarn making the least amount of noise possible, and hoping against hope that it would last until then. I was using it one evening, while Deane was trying to watch something on TV. He got so annoyed with the noise, he practically insisted I have it replaced! What could I do but oblige? 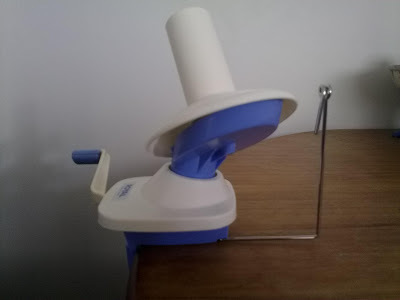 I mean, who am I to deny the man some peace and quiet (not only from the horrid noises emanating from said ball winder, but also the horrid noises emanating from the wife with the decrepit old ball winder)? I shall now be able to happily wind skein after skein of gorgeous yarn in preparation for knitting gorgeous snuggly things, without inconveniencing family members. Its a win/win! While waiting for my brand new ball winder to arrive, I had to hand wind a few balls of yarn (so as not to disturb the family peace) - one of which was a 20g skein of Artisan Lace. This stuff is t h i n !!! 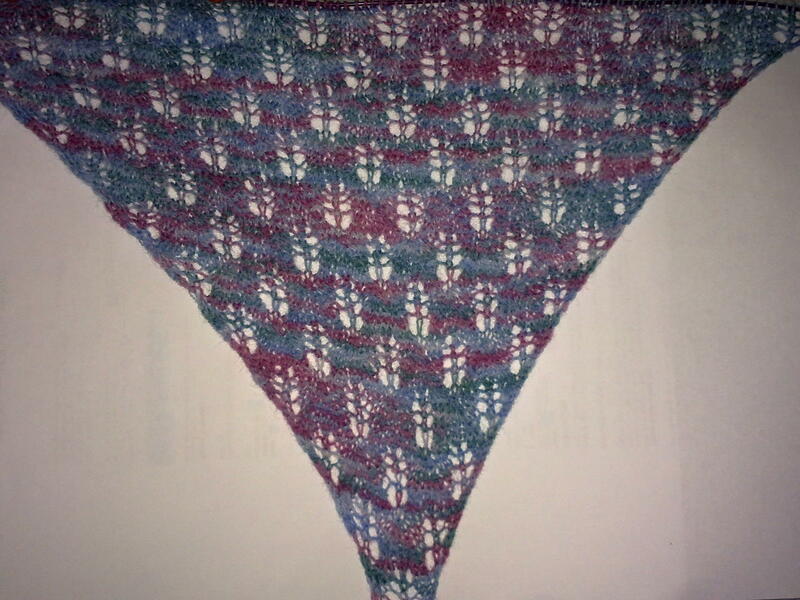 It says laceweight, but I'm going with something between cobweb and 2 ply laceweight. 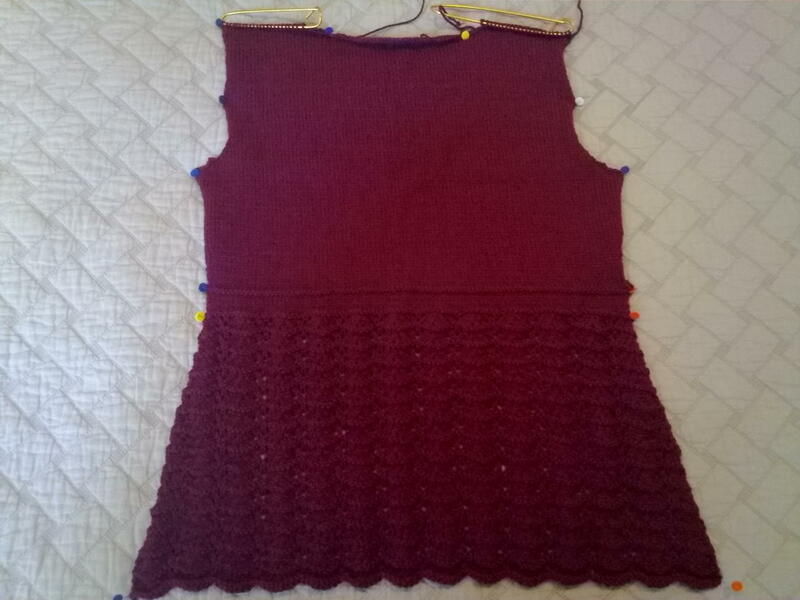 Its presenting a bit of a challenge, because you really have to pay attention to what you're knitting. Its so easy to accidentally pick up an extra stitch! But I'm enjoying it all the same. Quilting plans have been put on hold until after the kids are back at school because there just isn't enough room in our apartment to have all my gear out and have room for the boys to play. I have however, been at the wheel a few times this week. Only short bursts of about 20 minutes or so, but its better than nothing. I've started on the chocolate brown alpaca fibre, and spinning the locks as they are. They're a bit grubby (I've heard alpacas like rolling around in the dirt) so I get dirty hands, and a bunch of dust and dirt in my lap by the time I've finished, but its an interesting experiment. 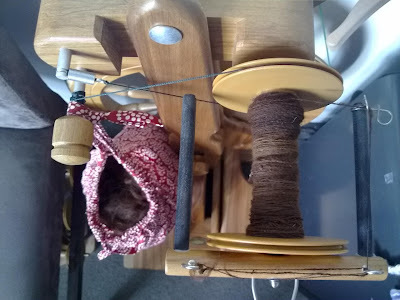 I haven't got much done so far, but I guess if I keep spinning a bit at a time, I'll reach the bottom of the fibre bag eventually. Sadly, I haven't been for a run for a couple of weeks now simply because I can't fit it in before Deane heads off to work in the morning, and I've learned from past experience that running in the afternoon does not suit me unless I want to be sick for the next several hours :-( So I'm going to make a concerted effort to get to the gym this weekend for a 5km.